Good evening. 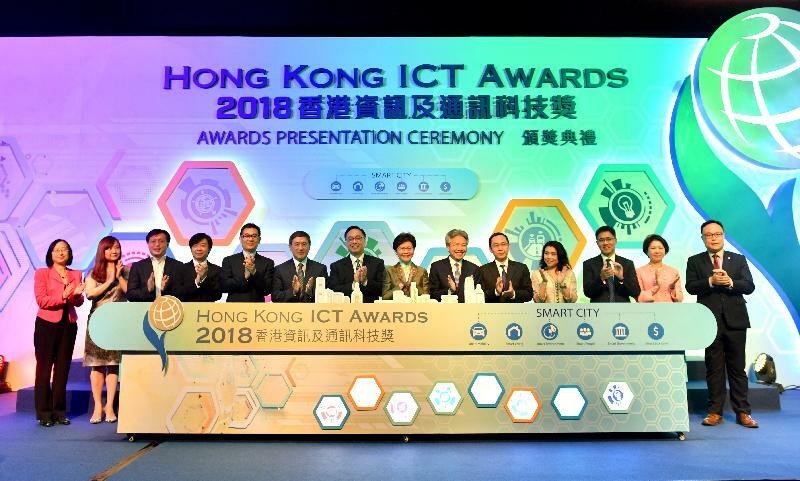 I am pleased to join you tonight for this year's Hong Kong ICT Awards Presentation Ceremony. This flagship industry event annually celebrates excellence in information and communications technology (ICT). For me, what makes these ICT Awards so dynamic and so vital is the breadth of sectors, industries and businesses participating, year after year. They embrace everything from entertainment and Fintech to business in general. And three smart awards are brand new for 2018. They cover living – from healthcare to home and lifestyle – as well as people and mobility. That latter category, mobility, smartly incorporates transport, logistics and tourism. My congratulations to the winners this year. 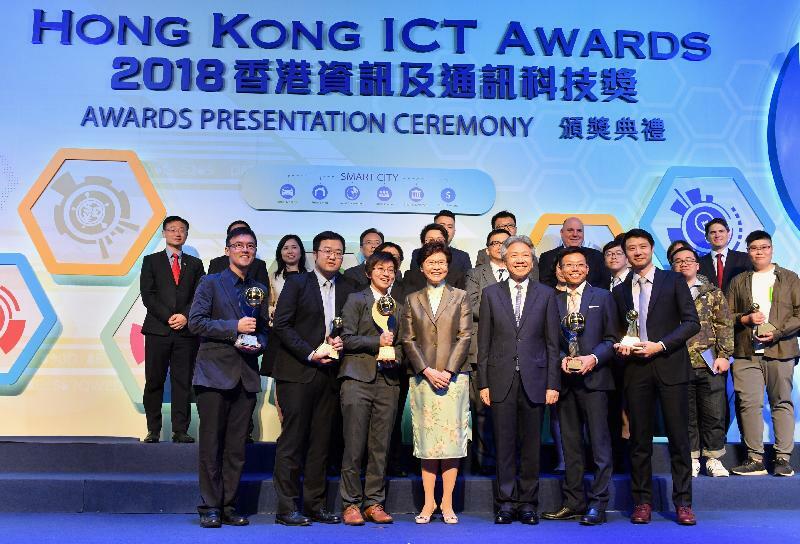 I am betting you are tomorrow's winners as well, helping drive Hong Kong's future with innovative leadership, and the products, applications and business solutions you bring to creative life. In my Policy Address delivered last October, I outlined an eight-pronged strategy to pursue innovation and technology development in Hong Kong, to re-tool and revitalise Hong Kong for this digital century. 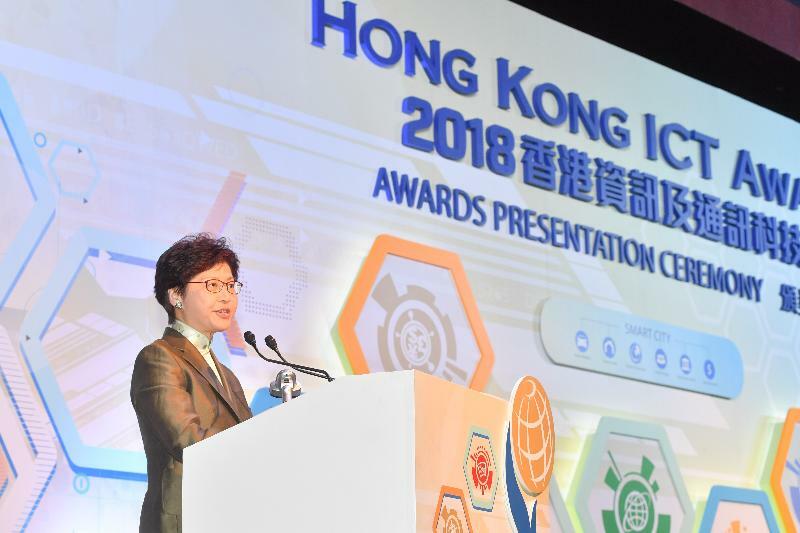 To realise that goal, and taking into account advice from experts and practitioners, the HKSAR Government has highlighted four major areas, they are, healthcare, artificial intelligence, smart city and Fintech. As you will see, they cover a wide range of policies and to ensure effective co-ordination and implementation, I am personally chairing the Steering Committee on Innovation and Technology, with membership comprising the Chief Secretary for Administration, the Financial Secretary and ten bureau Secretaries and their civil service colleagues. The Steering Committee met for the second time just last week. Let me add that enhancing our quality of life through the application of innovation and technology is equally essential to our future. Our Smart City Blueprint published last December sets out the major initiatives to be rolled out by my Government over the next five years. It also outlines the potential benefits to the public and our community at large. I am naturally delighted to see that the new award categories respond so well to our Smart City Blueprint. I would say the Financial Secretary has given us a major boost in his Budget Speech delivered on February 28, reserving $50 billion to support innovation and technology development in Hong Kong. That includes $7 billion to the Science Park to boost support for its tenants and set up a Smart Campus. Cyberport will also receive $200 million to enhance support for its start-ups. The Budget allocation to our two technology hubs is in addition to the $2 billion Innovation and Technology Venture Fund set up last year. That fund invests in local technology start-ups on a matching basis with venture capital. We will shortly announce the Venture Capital partners we have chosen to work with us. Later this year, we will launch a $500 million Technology Talent Scheme. It will include a Postdoctoral Hub programme to help companies recruit postdoctoral talents for scientific research and product development. I am happy to say that the Legislative Council has already approved an injection of $3 billion into the Research Endowment Fund, for giving studentships to local students admitted to research postgraduate programmes funded by our University Grants Committee. There is much more, including $10 billion to support the establishment of two research clusters, one on healthcare, and the other targeting artificial intelligence and robotics. I am confident they will attract renowned scientific research institutions and technology enterprises to Hong Kong to work with our local institutions and researchers. That can only mean more research opportunities for our young graduates. In short, my Government is determined to create a flourishing innovation and technology environment here in Hong Kong. But we cannot do it alone, which is why I am so encouraged by the winners of this year's ICT Awards. More than building businesses, you serve as role models, inspiring our youth, showing them the way to a future that will surely reward us all. So, allow me now to thank the organisers, committees and judging panels for their essential support. Ladies and gentlemen, I know you will enjoy this year’s Hong Kong ICT Awards night. And I look forward to hearing more good news from our winners in the months and years to come.